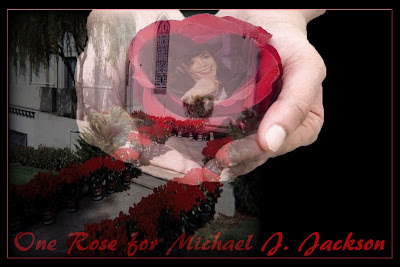 One Rose for Michael J. Jackson is pleased to announce the opening of the roses for June 25th. This has been the beautiful centerpiece at Forest Lawn from the very first year 2010 and has grown into a sea of red roses, lining the pathway to Holly Terrace. Each rose represents one person, showing their love... roses sent from all over the world honoring Michael & thanking him for all the treasures he created. He is truly missed everyday, but we all carry him in our hearts always. Some people might say why not donate this money to a charity,however I know all of us have done our part throughout the year so this day is the one day we can give our love back to Michael and show him our love. One voice, one heart, one rose...its ALL for L.O.V.E. I think this is a lovely event; kudos for your organizational leadership in MJ's memory. But perhaps this year it's time it matures into a next phase. Rather than hand over nearly $15,000 per year to a for-profit corporation to buy a few days' show to be enjoyed by relatively few, I urge you to use this wonderful momentum and redirect it instead towards a charitable tribute that relates in some meaningful way to MJ. Given that Mike had dedicated This is It to raising environmental awareness, which he repeatedly said in his last years was his top concern... and which was the focus of the last organized initiative he'd started but died before implementing... wouldn't something honoring this be more relevant to the man than roses? I urge you to add a choice to fans to either buy roses, or give that same amount to a nonprofit to plant a tree. A portion could go to a modest but attractive reusable memorial that displays the annual tree drive results. I daresay most fans would opt for the tree. But this approach would create a painless transition for those loyal to the rose. I recall a very small MJ tree drive in 2009; this could be a great shot in the arm for a much larger effort. I understand there are reputable nonprofits who can make treeplanting a simple add-on for your campaign. This would get more media attention and make a stronger statement about MJ and his fans. "Some people might say why not donate this money to a charity,however I know all of us have done our part throughout the year so this day is the one day we can give our love back to Michael and show him our love." I have to say I don't quite follow this logic and your resistance. Forgive my asking, but is a commission involved? Do please reconsider. Thanks for your efforts, and consideration of my request.